I'm the kind of gamer that actively seeks out weird and unique premises. If a game makes me do a double-take, we're on the right track. That's how I've discovered countless hidden gems on the PS4 and on prior console generations. When I heard that Ace of Seafood was an action game where fish did battle with laser attacks for dominance of the open sea, I did a double-take. Such a weird and whacky premise certainly piques your curiosity, but is it a good game in practice? The story in Ace of Seafood is only conveyed through cryptic sentences in the loading menus. It's not very in-depth, but it does give you a concept to work with. Essentially, humans have disappeared and the oceans are now populated by a variety of creatures that battle each other with laser-based attacks. How fish suddenly got the ability to shoot lasers, or where the humans went is never fully explained. The game takes this concept and runs with it. While it would have been interesting to see more of the story behind this concept, doing so would rob it of its hilarity. It's easier to present the concept and then move on than to try and reason or explain it. The writer in me wants to try and rationalize the disappearance of humanity and the sudden powers of sea life, but Ace of Seafood is the perfect example of a concept that is better left unexplained. It turns your head and makes you wonder, but ultimately it gets your attention. That's the most important part. It may be ridiculous, but you can't deny that it's enough to make you turn your head. Ace of Seafood opens with a short tutorial that gives you the basics of the game. Once this is complete, the ocean is open to you. The tutorial does a pretty good job of explaining everything, but there are some messages that didn't translate completely from Japanese to English. This results in some unclear instructions, but some experimentation with the controls and strategies eventually gave me an understanding of the mechanics. 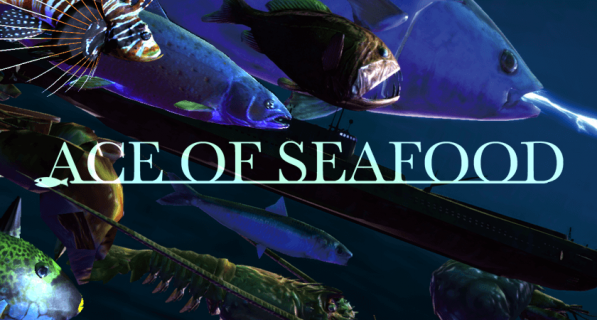 On the surface, it seems like a simple action game, but Ace of Seafood quickly becomes something much more strategic as you continue to play. You start as a simple fish, and you have a few different attacks that you can switch between on-the-fly. As you approach other creatures, they remain unaggressive towards you until you attack them. With that first volley of laster bursts or homing lasers, the battle begins. During combat, you can move freely around your target and lock on as well. Switching between manual and homing attacks is key, as some enemies have weaknesses or weak points. You'll quickly build up a squad of allies to bring with you as you move from reef-to-reef conquering more of the ocean. You can issue simple commands to your squad that change how they behave during battle sequences. While you start as a single fish, you collect the DNA of others that you destroy and can soon reorganize your squad to include different types of sea life. You can play as them too, offering a variety of different play styles and approaches to combat. Your food meter will occasionally need to be replenished, but it's not a crucial part of the gameplay. Instead, you'll collect and spend organic material to upgrade and boost the power of yourself and the members of your squad that you take into battle. It's a cool gameplay loop that continuously provides risk and reward. You never know if the reef you're heading toward is at your above your level, so it could be a complete disaster. The controls and gameplay feel smooth, but they can feel a little loose at times, particularly during combat. This is especially true when you're playing as a creature that crawls or jumps instead of swims, like a crab. The camera can be erratic during intense moments, which causes some frustration as it tries to sit behind the character during rapidly changing directions. I didn't feel like every death was a result of my skills. In some cases, it was the chaotic nature of the camera and controls that lost the battle. That didn't stop me from having fun for the majority of the time, but it does showcase some of the cracks in the presentation. Ace of Seafood is not a graphically impressive game. It would look pretty standard on an older system. It has sharp edges and blocky graphics with simple textures. A more stylized look could have made the presentation stand out and look less jagged, but the frame rate holds strong despite the chaotic nature of the gameplay. The soundtrack is a standout part of the overall presentation. It's an upbeat and intense tempo with lots of percussion and electronic undertones. It's energizing and exciting. For this type of game, it is easily the best approach to the music as it perfectly complements the intensity of the gameplay itself. Even when the tone changes and softer notes appear, the tempo never wavers as the percussion keeps everything moving. When you take it all together into a package, Ace of Seafood is a little rough around the edges, but it's unique and fun nonetheless. If you want something completely different, weird, and oddly addicting, Ace of Seafood is well worth a shot.